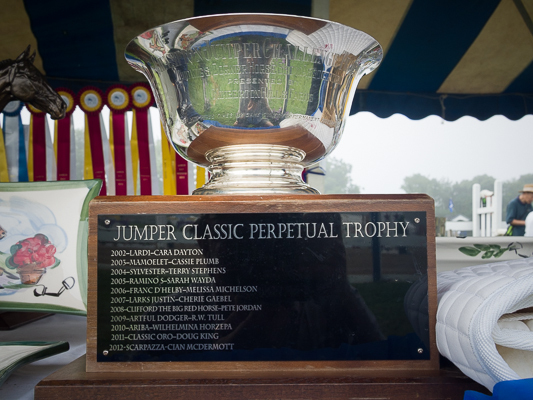 Many Division Champions & Class Winners at The Ludwig’s Corner Horse Show are presented with beautiful trophies which are then engraved with their names next to the past winners. In order to keep the history of the show alive and treasured by the local community, the trophies are housed throughout the year in two separate display cases. All trophy winners are given “keeper” awards to take home. Thanks to the generosity of DNB First and Ludwig’s Grille and Oyster Bar, the horse show can display the trophies in style! The Ludwig’s Grille and Oyster Bar has a beautiful Bryce Ritter trophy case located in their lobby. DNB First (Rt 401 and 100 intersection) houses more of our trophies off the lobby in a beautiful oak display case.